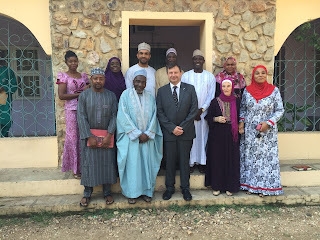 The United Kingdom Ambassador to Nigeria, Paul Arkwright took a working visit to Minna, the capital of Niger State. A Tweet shared by the diplomat on his twitter handle @PaulTArkwright showed him taking pictures with locals during his visit. He took pictures with some students and sang praises to Sheik Lemu for his efforts in providing adequate education for the locals. In the second tweet of his visit, he expressed the UK delight to support education in Nigeria.